The centre is situated in a beautiful landscape next to two nature reserves; and just two minutes walk from St Andrew’s church, which has within its cemetery a yew tree over 1,700 years old. The seventeenth century farm buildings have been restored and specially converted for use as a venue. They are set within seven acres of fields and gardens. The complex is based around a converted barn, with oak timbers, reed torching (lining the inside of the roof) and stone walls. 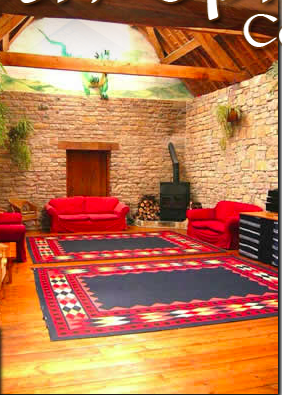 The feeling is medieval, but with modern comforts such as under-floor heating and a large woodstove. The high roof and skylights create a light, airy atmosphere. You have the joys of a hot tub and a sauna, delicious vegetarian food, walking up Dundon Hill (an iron-age hill fort) or Lollover Hill and the treat of visiting the alternative atmosphere of Glastonbury. £280 for the Dorm room and Dairy. En-suite rooms at £305, Camping £253 and any other requirements including special diets, please contact Ken ken [dot] orchard2 gmail [dot] com. A deposit of £60 will book you a place.